ProQuest is thrilled to announce the release of ProQuest Historical Statistical Abstracts of the United States. The product is an add-on to the current edition of The Statistical Abstract of the United States. 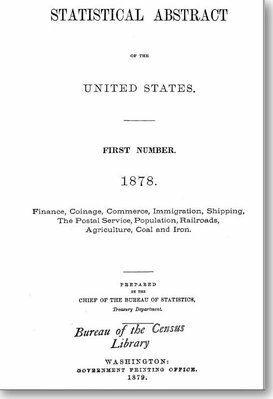 The Statistical Abstract of the United States was published from 1878 to 2012 by the U.S. Federal Government. In 2012, budget cuts eliminated this long-standing publication. That same year, ProQuest assumed responsibility for updating and maintaining the Statistical Abstract of the U.S., which has been enthusiastically accepted by libraries and librarians, as evidenced by its CODiE Award in 2013. ProQuest Historical Statistical Abstract of the United States is the enhanced digitization of the entire 1878 to 2012 collection, and will be released in 40-year increments, starting with the edition that will cover 1970-2012. Each year, for the next two years, each 40-year increment of historical data will be released as a separate product. The Historical Editions will include both GIF images and Excel files for every single table. No one else has converted each and every Statistical Abstract table into Excel files. >> Researchers looking for deep historical data that they can download and work with will be excited to use this product. For the first time, researchers will have the ability to search across Statistical Abstract Editions, easily locate data, and download it in Excel. >> Historians looking for data on the expansion of the railroad system or the rise of telegraphs and telephones will be thrilled to find all of that data unlocked and ready to use. >> Researchers analyzing the expansion and contraction of daily newspapers can find detailed data within this collection. >> Economists looking to compare current data to what was originally published, on topics such as personal saving rates, household income, and Gross Domestic Product. >> Medical historians can find smoking prevalence rates across decades. ProQuest Historical Statistical Abstracts of the United States is the perfect place for researchers of all types to start their search. The product offers thousands of tables and millions of data points across a wide variety of topics. And it provides the name and web address of the primary data sources. Currently the product includes editions back to 1998. By the end of 2014, we will have all of the editions back to 1970. Librarians: Sign up for a free trial now, and learn more about ProQuest Historical Statistical Abstracts of the United States and Statistical Abstract of the United States.